The spot in San Diego to rent a car quickly without compromising on quality or service is Rent-A-Car Right-A-Way. Get where you’re going fast, whether it’s in San Diego, Los Angeles, Las Vegas, or elsewhere! Our rate for car rental in San Diego is as low as $21 per day rentals for certain popular models. The stress of the airport or cruise ship terminal can put in you in a bleary-eyed daze. 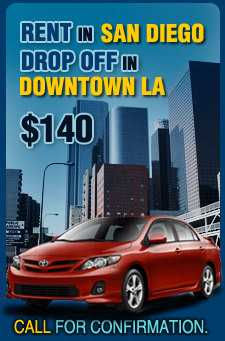 Rent-A-Car Right-A-Way’s is a convenient San Diego car rental agency near both locations. From the Airport or the Terminal, it's only a hop, skip and a jump to our rental desk at 1025 W. Laurel St.
There’ll be no surprises at the rental desk. Our mission is to fill all reservations, and ensure that we never overbook, or run out of the in-demand rental cars in San Diego. Our fleet consists of high quality compacts and standards, along with other popular sizes and styles. Everything you need to get going, Right-A-Way! But low prices and quick service aren’t enough to run a great business. Our reputation grows and grows thanks to a friendly and helpful staff, trained to make sure the rental counter is as brisk and enjoyable as it can be. 24 pickup and drop-off for car rental at San Diego Airport will make sure you get on your way, easily. Even in the dead of night our attendants will help you with your luggage, even when you’re hurrying to catch your redeye departure. For more information, check out our contact page, or call us at (619) 238-2488.